Scooby-Doo theme song from Shullsburg band during timeout. Yea or nay? Barneveld giving Shullsburg very few good looks at the basket in early going of D5 title game. Eagles lead 7-2. Barneveld leading Shullsburg 19-13. Malcolm Reed with six points for Barneveld. 16. 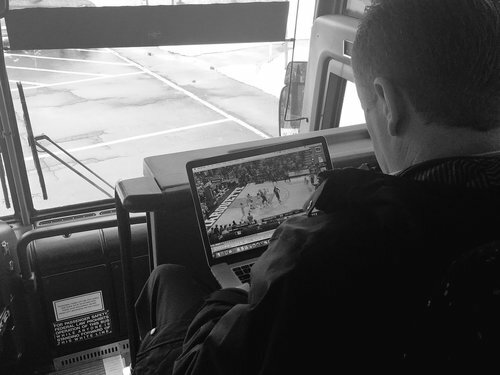 Scouting to the very last minute. Hey @TweetDeck , stop trying to force me to create a new column every time I do a search. That's just horrible UX design. Halftime from the Kohl Center: Barneveld 21, Shullsburg 15 in D5 title game. Barneveld holds a 21-15 lead over Shullsburg at halftime. Malcolm Reed with eight points for Barneveld. At the half, @GoGolden_Eagles lead @ShullsburgPride 21-15! Malcolm Reed leads Barneveld with 8pts. Hunter Matye leads Shullsburg with 4. 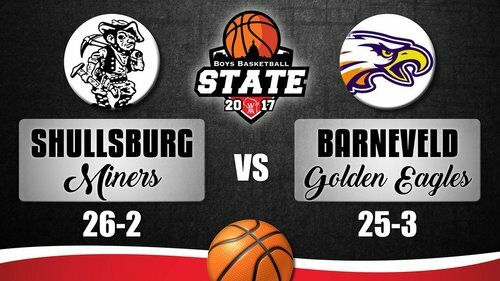 Barneveld has outscored Shullsburg 7-2 to start the 2nd half and owns a 28-17 lead with 15:01 left in D5 state-title game. Shullsburg rallies with 21-17, but Barneveld responds behind Mike Zouski and takes a 28-17 lead. Barneveld's Malcolm Reed (6-4) with a rebound basket and is the first player in double figures with 10 points. Eagles lead, 30-19. 2018 F Jonas Ignatius (6-1) once again comes off the bench and produces for Barneveld. His triple gives Eagles 39-22 lead over Shullsburg. 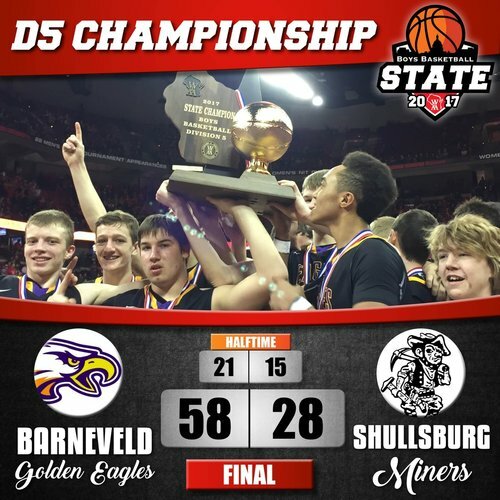 Barneveld well on its way to the school's first state championship in boys' basketball. Eagles lead Shullsburg 48-28 with 3:02. Barneveld coach Jim Myers won 6 titles and finished second 3 times as the school's girls' coach. 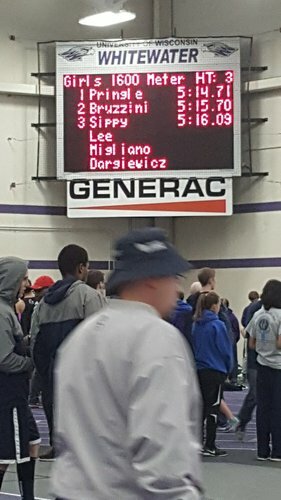 About to win 1st boys' title for school. 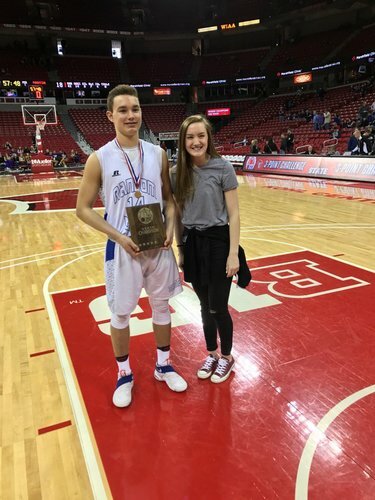 Barneveld's Jim Myers joins Tom Weinkauf (Marathon boys, Newman Catholic girls) as only coaches to win boys & girls state basketball titles. Barneveld wins the Division 5 state title. 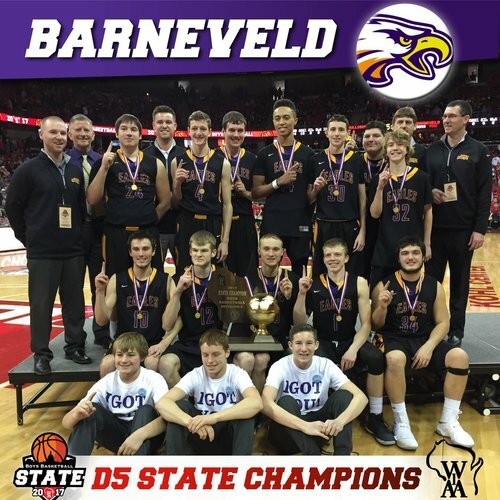 Barneveld's first boys basketball state crown. Final score: Barneveld 58, Shullsburg 28. Final: Barneveld 58, Shullsburg 28. Record set for fewest points for losing team in D5 title game. Jim Myers of Barneveld and Tom Weinkauf of Marathon/Newman are the only coaches to win WIAA state titles in boys and girls basketball. 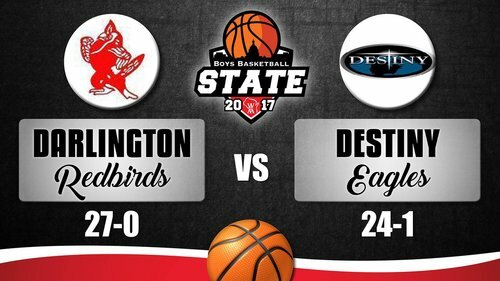 14 minutes until opening tip: D4 title game, Destiny vs. Darlington. 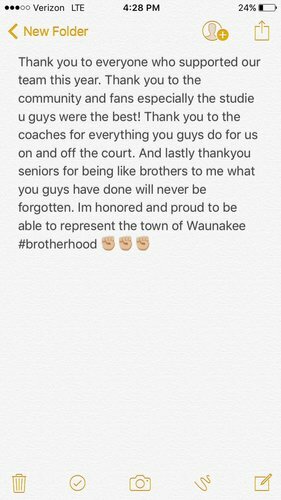 Top two teams in preseason meeting in March for state championship.